A skittish but loyal astromech, BB-8 shines as a stellar support for any squad. He is especially potent in Resistance and Droid squads. 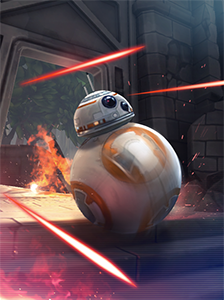 BB-8's ability Covert Data Transfer introduces a new buff, Secret Intel, that grants bonus Potency and spreads to allies that use a special ability. The First Order seeks the final piece of a lost galactic map held by BB-8. Deploy your forces to Takodana and Maz Kanata's ruined castle to capture the droid! Be sure to tread carefully as this astromech rolls with a formidable Squad. Defeat Veteran Smuggler Han, Chewbacca, Rey, Finn, and BB-8 himself. Succeed and earn shards for BB-8! With Captain Phasma at the helm as the Daily Login for the month, it's time for the rest of the Squad to follow shiny silver suit. Power up your First Order Squadron! Enjoy Double Drops on First Order nodes from 9/22 to 9/25. Rey: The offense up buff from her special ability "Leverage" will now correctly expire at 3 turns instead of 2. Italian- Grand Moff Tarkin's unique ability upgrade text for "Callous Conviction" at level 8 now correctly states Tenacity instead of Potency in Italian. Russian- Princess Leia's level 8 Zeta ability description "Against All Odds" now has the word "Protection" which was missing previously. Russian- Cad Bane's unique ability "Jedi Hunter" is now correctly translated in Russian. Russian-The spelling error of Barriss Offee's name is now fixed.